Brewing a collaborative recipe today with my good friend Brent Baughman. He's moving to Portland in a few weeks to continue his brewing adventures and if anyone is looking for a damn good veteran brewer they should hire him. We began taking stock of what was available to brew with. With the yeast selection (chico, lager, hefe, and two wit strains) on hand we decided to brew a Belgian style White beer with fresh Lime peel instead of the traditional curacao orange peel. A small twist on a classic style. 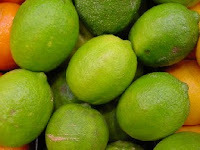 We used the zest of three limes and a half cup of lime juice added at the end of boil as well as the ground coriander. Fermented with Wyeast 3463 Forbidden Fruit yeast strain for a classic wit biere flavor profile. Just stumbled upon this blog via a homebrew forum. Any follow up on how this turned out? Sounds like it's almost a Key Lime Wit Biere. Key lime pie is my absolute favorite. I would love to hear how it turned out and get the recipe! Turned out very well. Nice balance of citrus flavor and wheat background. Finished dry and drinkable. Email me at HopfenTreader@gmail.com and I'll send out any recipe requested, cheers.